So who is crazy about artichokes? Yep, pretty much everyone I know. And for good reason – they are delicious (and extremely luxurious for a vegetable)! Artichokes seem to give that “this meal is special” feeling. And since my daughter has discovered her love of artichokes, I have been expected to bring them home after every trip to the grocery store! For me, cooking and serving food is one of the purest expressions of love. Whether it’s love for yourself or love for another, cooking a meal that brings nourishment and pleasure is not only feeding your body, but also your spirit and that of your family. It may not be a home-run every night, but keeping love in mind sets an intention that will come through in your cooking. I can make food for (and with) my daughter and all at once have her feel special, loved and full. Not bad for a Wednesday night dinner! 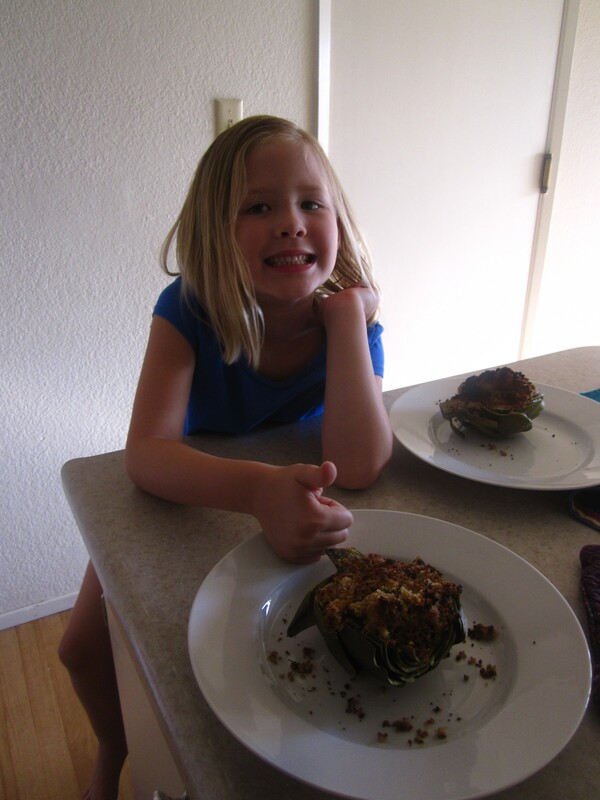 One night recently, she and I decided to try and make stuffed artichokes…and it was a complete success! We used some left over prosciutto (from the Pan con Tomate recipe, actually), some gorgonzola cheese & bread crumbs. I could try to describe how delicious they were, but it’s easier to just say this – we had 4 large stuffed artichoke halves when we sat down to dinner. We knew we had to save one for the husband who was at work. She & I each inhaled our own and both wanted that second one. Since she had cleaned her plate, I offered her dessert (selfishly thinking she’d take the ice cream and leave me the ‘choke). NOPE! She turned down ice cream just to take another helping of this delectable dish! Now for the recipe. I made a VERY basic one, so try to come up with some flavor combinations of your own for the stuffing. I will toss out some ideas and good amounts to use, but feel free to take this and run with it. These can be served as a side, appetizer or main course, and are the perfect blend of nutrition and pleasure! This is not the place for those adorable little-artichokes. Get big ones. Fortunately artichokes keep well in the fridge for awhile. I keep them out of the crisper to preserve them. Gotta have fresh lemon juice! Here you can use seasoned or plain, but avoid Panko. If you don’t have bread crumbs on hand, just throw a couple pieces of bread into a freezer bag and take out all the aggressions of the day on it. Or put it in a blender or food processor. Then toast them in a skillet with some olive oil and a pinch of salt. Voila! Olive oil is my go-to oil. Use any kind you prefer. I love the crunch of slightly coarse sea salt on an artichoke. I would still use kosher for the filling though. For the artichokes in the pictures, I used prosciutto & gorgonzola cheese. I would add about ¼ cup for each added flavor ingredient – but use your common sense. Freshly grated parmesan, fresh chopped tomatoes, garlic & basil would be amazing. So would just lemon zest & some fresh herbage. If you had some leftover couscous you could replace the breadcrumbs with that, then add shallots, raisins, lemon juice, cinnamon and it’d be kind of Moroccan. The garlic is optional but who would want to skip it? It’s doing double duty for this recipe. The garlic flavor will be in the stuffing, but it’s also going to be an aromatic for the steaming. 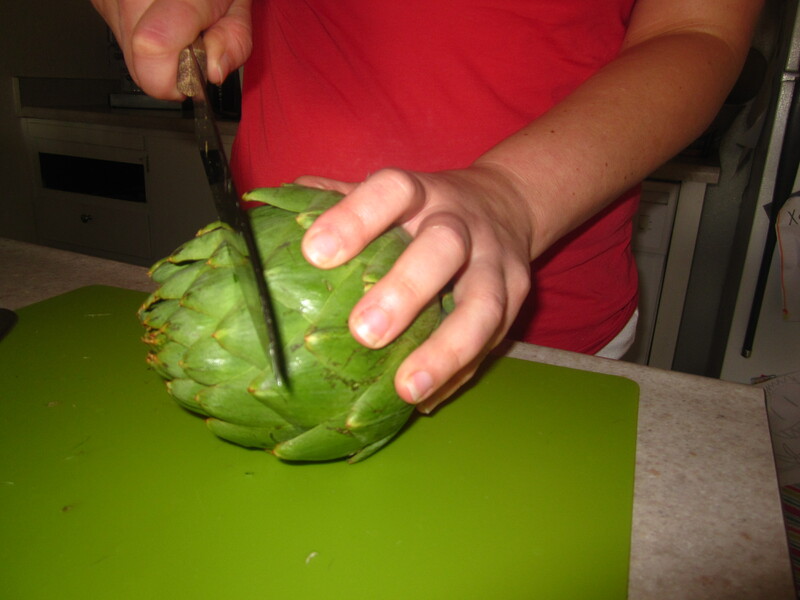 Cut off the artichoke stems leaving about an inch, and then use a vegetable peeler to remove the outer layer of the remaining stem. Cut off the tip of the artichokes, leaving a sort of flat top. Then cut them in half and remove the thistle. This does a couple of things. When we remove the top we also remove most of the tips of leaves that have a thorn. We also are making it easier for the steam to get inside the artichoke and do its job. The thistle is that weird fuzzy part in the center. This is actually the flower that, if left on the plant, will bloom into a lovely purple. But we don’t want to eat it, so we have to cut it out. I also take out some of the leaves on the outside of that section, the ones that are kind of translucent and very thin and flimsy. Place in pot with steamer. Drizzle with the juice of both lemons and about a tablespoon of olive oil. Sprinkle garlic over artichokes and sprinkle a heavy pinch of salt. Toss the lemon shells either in the water or the steamer. If you don’t have a steamer (I don’t) or an insert for a pot – not to worry. 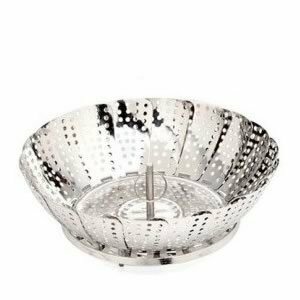 In a pinch, a metal strainer will work inside a large pot. Touching the water a little won’t hurt the artichokes. I would recommend having a steamer insert though. Steaming is a great short cut. And even though I rarely serve things “steamed”, I use steaming as a means-to-an-end in many dishes. It’s so easy! You can find a steamer insert for about $7 at any large supermarket or Target. I saw some really good ones on Amazon for about $8. Back to the recipe – The lemon is also doing more than one thing here. The acid in the juices will stop the artichokes from oxidizing (turning brown). Lemon juice stops most fruits and veggies from doing that. It is also one of our other aromatics. By putting the lemon shells in, we are adding all the essential oil in the rind without having to zest. The steam and hot water will bring those out. Partially cover and steam for about 30 minutes. Preheat oven to 425 degrees. By partially covered, I mean just barely cracked. We want the tiniest amount of steam to escape. Doing this (along with the lemon) will stop the artichokes from getting that weird, slightly bitter taste they can sometimes have. Whole artichokes of large stature usually need to steam for about 45 minutes to an hour. By cutting the artichokes in half, we did the same thing to the cook time. Yay! In a mixing bowl, combine bread crumbs, 2 tablespoons olive oil and any other flavorings (I would recommend about ¼ cup amount for each extra flavor added). The olive oil is a binding agent for the filling. It will help hold it all together. It will also help toast everything in the oven. I would add enough so that the breadcrumbs look slightly wet. If you wanted to cut down on the oil I would use fresh tomatoes or something that has moisture although you’ll still need a tad of oil for the tops at the end.When the artichokes are done steaming, remove from the pan and lie face up on a baking sheet. If you want a crispy crust on the artichokes, at this point use a grill, skillet or your broiler to just sear the tops for about a minute. 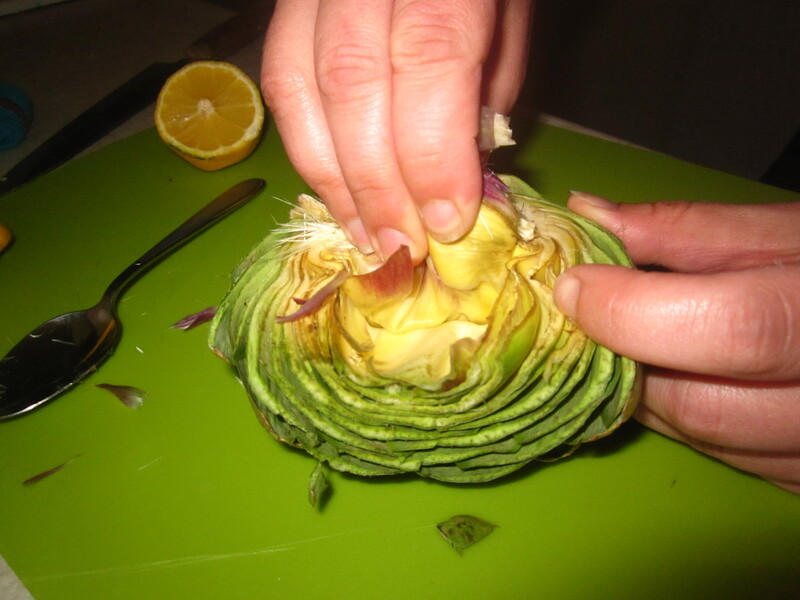 With a spoon or small ice cream scooper, add filling to the center area of the artichokes. Drizzle with olive oil very lightly. At this step the olive oil is purely for browning. Think of it as the tanning lotion for this dish! Bake for 10 – 15 minutes, just until the tops of the stuffing are golden brown.